Opening Day is here! I cannot think of a better way to celebrate what should be a national holiday by planting my flag and making some bold predictions! These statements are based on players I either like or do not like relative to the market. Feel free to chime in with some of your own in the comments section. Here are my bold predictions for 2019. The Washington Nationals called up Juan Soto last season and the phenom had one of the best seasons we have seen from a teenager in MLB history. Soto exhibited plate discipline rarely seen from a seasoned veteran, much less a 19-year old. With Bryce Harper now out of the fold, Soto will be leaned on to produce at a similar clip this season. Fantasy owners have little doubt Soto will do so. I am a little more skeptical. First, Soto hits the ball on the ground a lot. Just 28.8 percent of batted balls were flyballs last season. His 24.7 percent HR/FB masked this tendency, as Soto hit 22 home runs during his rookie campaign. He also doesn’t run, totaling just 21 stolen base attempts through three professional seasons. I do not think Soto will be bad. He has a lot of tools and will be a fine hitter this season and beyond. I just think he is going way too high in drafts. I have Soto projected for a .285-90-25-90-8 season. Again, that is a very good season and certainly nothing to cast aside. But you can get similar and perhaps even better production from Puig much later. Puig is one of five players who have recorded at least 23 homers and 15 steals in each of the last two seasons. The other four players on this list are all being drafted as top-10 players. Yet Puig can often be had after pick 100. Puig begins his first season in Cincinnati after seven years in the Dodgers’ organization. He should play pretty much every day in a much-improved lineup, even with the injury to Scooter Gennett. I think Puig’s power will be on full display in the friendly surroundings of Great American Ball Park. He will see a ton of RBI opportunities hitting behind on-base machines Jesse Winker and Joey Votto. Puig should easily surpass his career-high of 74 RBI. I have Puig projected for .275-80-30-100-12 in 2019, putting him slightly ahead of Soto in my rankings. If you do not think that is bold, you have not been on Twitter in the last six weeks. OK, how about this? The helium is at an all-time high for Paddack, who is set to make his Major League debut this weekend. Paddack has a great pitch mix and impeccable command and control. He had just seven unintentional walks in 90 innings last season while striking out 120 hitters. But I do not think he will sport anywhere near those prodigious ratios in the bigs. Furthermore, I fully expect him to be on an innings limit. He has thrown less than 180 innings in four years, in part due to undergoing Tommy John surgery in 2016 and missing the 2017 season. Paddack will provide solid numbers when he pitches, and I’m in if you can get him at the right price. I just do not think he is a top-40 starter, as some recent drafts would suggest. Paddack is going to be great at some point in his career, and probably sooner than later. I just do not think it will happen this season. Kenta Maeda made just 20 starts and finished last season in the bullpen. That has seemingly depressed his draft price and kept Maeda under the radar. But people seem to forget just how good Maeda was last season. Maeda was one of 19 pitchers who threw at least 120 innings and had a K-BB rate of at least 20 percent. The other 17 (I am excluding Ross Stripling, who is listed as a reliever) are all being drafted inside the top 25 among starting pitchers. Maeda is being drafted 63rd. Maeda combines a devastating changeup (26.5 swinging strike rate, 42.4 K-BB rate!) and slider (25.5, 29.0) to attack hitters. He also has a solid cutter (20.3, 25.0), which he scrapped when he went to the bullpen. Maeda has a variety of ways to keep hitters off balance and plays on a good team in a good park for pitchers. Clayton Kershaw and Rich Hill are currently on the shelf with injuries. This only entrenches Maeda’s status as a mainstay in the rotation. I think Maeda is one of the biggest bargains on the board this season. I have him down for 13 wins, a 3.71 ERA, a 1.19 WHIP and 180 strikeouts in 160 innings this season. As I mentioned in my updated relief pitcher rankings, Hader is currently my third-ranked reliever. That ranking is based on a projection that Hader has a year similar to last, where he is used in high-leverage situations and picks up the occasional save. He had 12 saves a year ago and finished fourth among relievers. 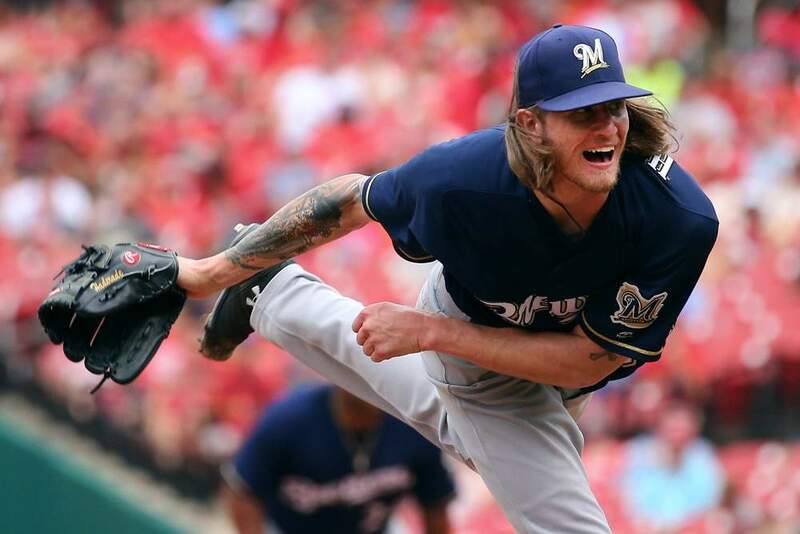 However, with Corey Knebel and Jeremy Jeffress on the shelf, it is entirely possible that Hader closes for a majority of the 2019 season. If that is the case, I think Hader is easily the top reliever in fantasy leagues this year. The Brewers have had over 100 saves as a team since 2017. If Hader gets just two-thirds of that, we’re talking about 35 saves. Add in 120+ strikeouts and solid ratios, and you’ve got the best reliever in fantasy this season. Alvarado is another closer who I have ranked higher than most, and yet I feel my initial rankings are a bit conservative on. The 23-year old really emerged towards the end of last season, and I expect him to bring those gains into 2019. Alvarado relies on a heavy sinker and an outstanding slider to generate a ton of strikeouts and ground balls. He has allowed just two home runs in 93.2 career innings and has held hitters to a .190 batting average while striking out 28.2 percent of hitters. Despite this resume, he is being drafted just 19th among closers. I think part of the skepticism stems from Rays’ manager Kevin Cash’s fluid bullpen roles and use of openers. However, I believe this narrative is not taking a couple of things into account. First, the Rays have not had a lot of quality starting pitching options in recent years. However, they will head into the year with Cy Young Award winner Blake Snell, Charlie Morton, and Tyler Glasnow. Tampa has invested in all three, and I expect them all to make the requisite 30-35 starts. Ryan Yarbrough and Yonny Chirinos figure to fall in line in some capacity as either starters or behind an opener. But it’s not as if Tampa will use an opener in 80 percent of their games. More importantly, I do not expect Alvarado is in any danger of being that opener. Though Cash has a reputation for having a fluid bullpen, he has also shown that he will stick with a closer who gets the job done. From 2015-2017, the Rays used a primary closer. Brad Boxberger had 41 saves in 2015 and Alex Colome averaged 42 saves from 2016-2017. It was only following last season’s trade of Colome that Cash used multiple relievers in the role. Even then, Sergio Romo recorded all 25 of his saves after Memorial Day. Alvarado will take the job and run with it this season, finishing the year as a top-5 fantasy reliever.